Jonathan Griffin of CMD shares the effects of the growth of vintage and up-cycling trends in the interior design world and how wireless lighting will help solve a variety of renovation project challenges. The trend for up-cycling has had a significant effect on the interior design world, so much so that ‘vintage’ is arguably more current than ‘new.’ Up-cycling has stamped its mark is on the property market, with derelict warehouses and factories being preserved to a new lease of life and repurposed into stylish offices, retail spaces, clubs, bars, and apartments. The benefits that these upgrades bring have proved to be immense, especially in the case of London’s Shoreditch, Manchester’s Cotton Mills, and Liverpool’s Albert Docks. In a relatively short amount of time these areas were transformed from run down, undesirable locations into current hotspots where the hippest of the hip work, rest, and play. One of the best things about repurposing old buildings is the fact that the ‘oldness’ is the selling point. So rather than taking these buildings as shells and giving them a complete makeover, architects and designers are choosing to work with the raw bones of the building – essentially ‘upcycling’ the existing décor and original features to retain the essence of the building ‘s former life, while making it fit for modern-day use. Of course, any renovation project comes hand in hand with its own set of challenges, and while retaining the original décor of a building may reduce extensive decorating costs, it can also present specific issues, especially when it comes to installing electrical solutions to facilitate modern-day working needs. Old buildings often come complete with neglected wiring, which raises a red flag for health and safety reasons. The simple (although not necessarily most cost effective) option would be to rip out all old wiring and start over; however, when designers are working to retain old plaster and brickwork, this may not be an easy task to accomplish. In many cases, general electrical installation can be done at floor level, to facilitate the additional power supplies necessary for the digital age. Lighting, however, proves to be more of a problem, as installing new lighting systems inevitably means disrupting walls and ceilings — the very features that can be preserved. Drilling into old plasterwork to remove and replace wiring is potentially a recipe for disaster, as plaster is likely to crack and crumble. At best this will create aesthetic problems, at worst, it may even cause structural ones. Likewise, the cosmetic benefits of old, exposed brickwork are undoubtedly going to be compromised by wiring – concealed or visible. With these issues to deal with, there needs to be a solution for installing efficient lighting with minimal disruption. There is a solution, however, thanks to the latest innovation in lighting technology — wireless lighting. The beauty of wireless lighting is that it involves minimal installation (often utilizing existing sockets), and as it is controlled remotely via smartphone or tablet, it does not require any concealed wiring. By making this change, walls and ceilings remain untouched and lighting can be positioned wherever necessary throughout the space. Wireless lighting also offers significant cost-saving benefits, reducing wasted energy by 50 percent. This is particularly advantageous when it comes to lighting industrial buildings, as they are often large and will, therefore, require a considerable amount of illumination. Because an average of 40 percent of buildings operation costs are due to lighting, this is potentially a huge financial drain for a company. Individual lights can be programmed to come on and off at specific times so that they are only turned on when needed. Motion sensors mean that unoccupied areas are not illuminated and not needlessly lit. Available natural daylight can be harvested to keep artificial lighting to a minimum. Brightness can be adjusted according to ambient lighting throughout the day. Brightness can also be adjusted on a ‘light-by-light’ basis, meaning that different areas of the space can be set to different lighting temperatures and intensity to suit different tasks. When lighting a large space, different areas can be “customized” perhaps with dimmer lighting for relaxed or creative areas and brighter lighting for more intricate tasks. Well-positioned lighting is also a great way to make a significant space feel more comfortable, as glaring overhead lights rarely create a pleasing working environment. 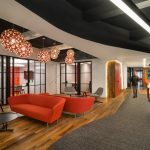 Where space has been broken down into individual offices, it can be challenging to create an even distribution of light, as walls often must be positioned to fit around existing windows, doors and possibly even pillars or beams. A wireless system makes it much easier to position lighting exactly where it is required, again, because you are not restricted by inbuilt wiring. If you have been put off embracing the aesthetic and spatial benefits of an antique building because of technological concerns, it may be time to think again. The practical and financial benefits of wireless lighting now make it possible to have the best of both worlds.